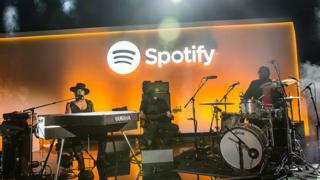 Music streaming company Spotify is reportedly in talks to take over $700m (£535m) rival Soundcloud. The two sides are in advanced negotiations, according to the Financial Times. The talks come at a time when competition in the streaming music sector is intensifying. Sweden's Spotify remains the market leader but faces increasing competition from Apple Music and Amazon's recently launched music service. German-based SoundCloud built its business by allowing artists to upload their music and share it with fans on social media and blogs. It has established the company as an influential player in the music industry, especially in the dance music genre. In March, the company launched a pay-for streaming service similar to the offering from Spotify or Apple Music. The firm has failed so far to make a profit, but has Twitter as its most high profile investor. Mark Mulligan, an analyst at consultancy Midia, has been blogging on the takeover claims. "Soundcloud has been shopping itself around for some time, while Spotify needs to continue outpacing Apple as it heads towards an initial public offering." But a deal would be "far from a guaranteed winner for Spotify" as Soundcloud's growth may have "peaked" in 2014, he says. Spotify, meanwhile, has seen its revenues reach €1.95bn ($2.2bn; £1.5bn) over the past year, but still has failed to make a profit. The platform offers music over the internet for nothing, with advertisements or ad-free for a fixed monthly rate. Apple launched its own music streaming service in 2015, while there are many smaller companies such as Rhapsody, Tidal or Deezer offering a similar service. Spotify currently has 40 million paying subscribers, while next big player Apple Music has 17 million.